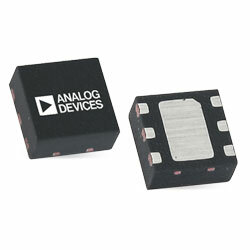 Analog Devices ADL6010 Envelope Detector is a versatile, broadband envelope detector covering the microwave spectrum. The device offers state-of-the-art accuracy with very low power consumption (8mW) in a simple, easy to use six-lead format. The output is a baseband voltage proportional to the instantaneous amplitude of the RF input signal. The device displays minimal slope variation of the RF input to envelope output transfer function from 0.5GHz to 43.5GHz. The detector cell uses a proprietary eight Schottky diode array followed by a novel lineariser circuit that creates a linear voltmeter. This is achieved with an overall scaling factor (or transfer gain) of nominally x2.2 relative to the voltage amplitude of the input. Typical applications include microwave point to point links, microwave instrumentation, and radar-based measurement systems.